Cris Tovani writes I Read It, But I Don't Get It in this kind of patient adventure tone so that you feel like you're in Ms. Fritz's class, riding on the Magic School Bus. Her students who struggled to read were put into her Reading Workshop and felt things like, "It's too late for me to read" and I love how personal and professional Cris Tovani is, like how real she is when she describes her own reading history of fake-reading for classes up to the end of high school and feeling worried that she couldn't continue with this touching-the-surface style in college (YES, ME TOO, OMG re: Shakespeare) and then connecting/relating to her students with this information.I've read so much about the writing process, like what happens when you write (you think), but less about reading (just Calvino's If on a winter's night maybe) even though I periodically feel concerned that I think more about thinking than thinking about things specifically. I want to read more books like this about people who catch up later than usual, or re-learn their learning to realize that subjects they struggled with were made inaccessible somehow, like this article on: "An experience with some able women who avoid mathematics.pdf".Anyway, I definitely wrongly believed in college that smart people read things fast and got them the first time and I kept trying to figure out how to keep up with my required reading aka how do I SPEED-READ. But Cris Tovani is like, "no, you adjust to the level of difficulty in the text: slow down when it's hard, speed up when it's easy" and some things she writes seem like they should be "obvious" but I'm glad to see it stated so explicitly, such as:+ book clubs & classes & just discussion: creating meaning together, making sense of the text together+ tracking your confusion and distraction (lol: I enjoyed the parts where Cris or the students admit that their mind just wanders off, like the girl who read the word party and started thinking of the party she went to the night before)+ two reading voices: the one that pronounces the words, the one that responds with thoughts & feelings & questions+ asking clarification & pondering questions before, during, after your reading+ lol @ outlandish student responses to text with no evidence and responding that it's their opinion, so it's untouchable re: its in/accuracy. I think I did this a lot in college. Not making good inferences and trying to look for it in the text but it's not there- - -I feel inspired to be a reading teacher. Cris Tovani concluded in 2000 that "Tomorrow's citizens face greater demands than ever before. The written word is no longer restricted to paper form. Children of all ages are being bombarded with information from the Internet and other electronic forms of print. The "E"-generation needs to comprehend more than ever before. Readers of tomorrow must do more than memorize words. They must be prepared to analyze, validate, and ask the next logical question. They have to know how to think."Yes. Cris Tovani, herself once a struggling reader, provides some excellent advice. While not as good as Notice and Note: Strategies for Close Reading (but how many books are? ), Tovani still provides plenty of good strategies for reluctant readers or those who read fluently but cannot decipher meaning. I Just Can't Get Into Books "Pedro you better stop playing video games and start to read books ,I'm not asking you to, I'm telling you." "But mom I can't do it, I tried yet, when I'm reading I have difficulties." The major issue here is that I just can't get into books. I read, but I can't focus. When I'm reading I skip lines, sometimes chapters. Different things pop’s up in my head . "When we got outside of the duke of the New York we viddied, by the man bar's long liothed window." This quote is from the Clockwork Orange by Anthony Burgess. It was complicated for me to get a deep connection of what is coming up on the next paragraph, and what I just read before that. I wish that books would talk to me and I would find them more interesting. First I always start off excited about a book. I read the cover, look for the name of the Author, find the year it was published, skim through and see if there are any pictures, I always start out good. But then that concentration quickly disappears. I start to skip lines, and sometimes I read the first paragraph of a chapter and then skip to the end. I drink a juice, I have a little snack on the side, I make sure I'm clean and wide awake, but it just doest't work for me. When I was reading the The Adventures of Huckleberry Finn by Mark Twain during my freshmen year, it was the most difficult book I ever read. I had to look it up on Spark Notes and read there what it was about, and what happen in each chapter so I could get a decent grade. I don't want to but i have to. It seems like a constant struggle in my self-conscience. Often times when I'm reading a book, different things pops up in my head. Consequently, When I see a word that I'm familiar with I connect it to something else, like a song for instance. I start to sing without thinking that I have a book in my hand, my focus on the book runs away, and I find myself looking for the song on the Internet or on my ipod. The fact that my dad is miles and miles away from me doest't help me to concentrate either. Especially if I find a word that makes me think about him, it takes away my focus on the book. Many concerned thoughts jump into my head. I start to wonder about everything my dad have been trough, what is he doing at that exact moment, and if he is okay or not. I miss him a lot. This summer when I went to go visit him, its fair to say that I did not pick up a book at all. Even more, I can't really comprehend what's happening in the book. When I'm reading and I see a bunch of pages without pictures, I get really bored and I just read without understanding what I'm reading. It's not interesting and does not connect to me. I read to myself, listening with my right ear, but it just goes right out through my left ear. I tried to read this book called A Separate Peace by John Knowles, and it says "He had unconsciously invented a game which brought his own athletic gifts to their highest pitch." When I read that my mind just zoned out and I started day dreaming. After hearing the words "game" and "pitch", every game that I ever played, and anything else about baseball that I can think of, just popped into my head.Reading books can be hard for certain people. I'm not lying here. Everything I say is true, its happens to me. I can't focus, I skip chapters, and I can't concentrate. When I'm reading and I'm looking at a word that I'm familiar with, it makes me think of something else, and I don't even comprehend. I'm a sophomore now and I know it's not good to have the issue while I am reading a book. Recently I learned in history class, that to be a good reader we need to do public speaking and writing. I have good abilities to do both of them. The reason why I am writing this essay is to get interested in reading a book. So I can add the reading skills to my head , and connect them to my speaking and writing skills. Tell everyone how proud I am for gaining these skills and clearly tell them that my second language is English. I have been teaching sixth grade for the past 16 years and there was nothing in this book that was new to me. All of the strategies she discussed were things that I have been doing with my students for years. However she did have a good list of strategies that I could share with my students. I already do them but it was nice to see them all written up. I also liked her example for how she teaches a purpose for reading. There were some helpful examples in the back as well. The other thing I liked was her explanation of inference and opinion . This is something that is difficult for many students. I would recommend this book for college students learning how to be teachers. This may be the most useful, hands-on, honest approach for how to teach struggling readers how to become masterful, independent readers. I'm so glad I read (and will reread!) this important book. I used many of the strategies this year and was amazed at their power and purpose. Many of my ninth graders read The Odyssey with more focus and insight than I did! Yay! Everyone wins! Initially, I read I Read It, But I Don't Get It over a decade ago. I loved it then and still adore this professional resource now. Cris Tovani reminds me that reading is so much more than decoding and pronouncing words - it's a complex process between the reader and what he or she is reading. Although this book is about strategy instruction in reading, Cris Tovani's message is more about giving students agency to make meaning for whatever they are reading - not just teaching students the strategy. She emphasizes that students need to know why and how strategies make students stronger readers. Through her writing, you can tell that Cris Tovani is such an honest and reflective practitioner, providing examples of how conversations and insights from her students have moved her forward in her own learning. In my opinion, she was one of the forerunners of how to clearly make her thinking visible through modeling to students (especially adolescent readers). For me, she is the kind of teacher I strive to be. My district sent me this book because I work with struggling readers. I'd planned to take it home for the summer but it ended up in the wrong box. It took me a while to find it again so I'll probably spend some time re-reading.It's a good book, filled with anecdotes. The strategies tend to be general but I like the way the anecdotes deal with both struggling readers and "successful" readers. After all, don't we all become struggling readers when we read a topic we are unfamiliar with?I would recommend reading this short book in small doses, perhaps a chapter a day. That provides more time to digest and ponder what is being read. I wouldn't recommend breezing through it (a true temptation due to the brevity of the book). I found the book to be specific in its suggestions and helpful in supporting the classroom teacher's efforts in helping students experience success. Have you ever watched someone speak in English to a person who appears to understand no English? When the speaker realizes the lack of understanding how often have you seen them repeat what they said but just slower and louder? I really like the specific suggestions Tovani offers teachers, and readers, many ways to help "fix" the struggles they are experiencing with reading. Cris has a couple of youtube video's discussing her work:http://www.youtube.com/watch?v=c3ir43...To check one out. One of the things I struggle with is think alouds and this book truly helped me with practical ways to improve my think alouds. Although I am already familiar with many of the comprehension strategies that Cris Tovani mentions in the book, I love the practical ways to incorporate them into the classroom. The only thing I found missing from this book is reading for fun. I loved this book. It was honest, readable, and helpful. Tovani is forthcoming about mistakes she has made in the classroom and things that we all do in the interest of time and moving lessons along. I expect that this is a book I will return to over and over again in my career (or at least in these next couple of years). This is a must read for any secondary teacher -regardless of the subject you teach. What do you do when students struggle to read the text you assign to them? This is a short, quick, practical guide for how to help students comprehend difficult text.I also recommend it to any parent of a struggling reader. The ideas in here were not really new. I'm a Title I reading specialist and HS English teacher, so I understand the concepts of teaching comprehension. However, there's very few books and resources on teaching reading to older students. So, I got this book with the hopes that i would learn something new. If anything, it reinforced what I'm doing and pushed me to do some things more often/to a greater extent. I rated it 3 stars bc, if you don't have the reading degree and experience I have, this book could be quite valuable for you. I need to write an adolescent reading book. Just saying. A must-read for any teacher whose content depends on students reading and constructing meaning from text. I picked up Tovani in preparation for a Reading Intervention class; I plan on using her strategies, lessons, and activities in all of my courses. This is the book we should have read in my literacy methods course. Fantastic book that I recommend to all English teachers! Wonderful , practical strategies to improve reading comprehension levels. It is useful for teaching all levels of readers, but I am excited to use this with my struggling readers, especially. Was this anything groundbreaking? No. But her classroom examples and teaching points were helpful. 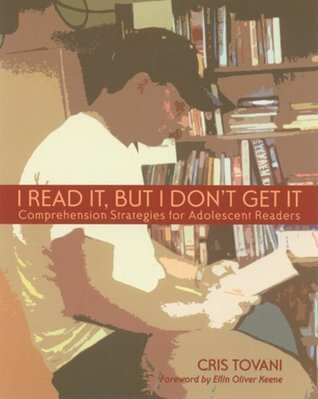 InI Read It, but I Don't Get It: Comprehension Strategies for Adolescent Readers , Tovani shares practical strategies and reading theory in an easy to read format. Throughout the book Tovani relays conversations and scenarios from her own teaching experiences with adolescents in a high school reading workshop as well as her own history as a poor reader. The emphasis throughout the book is on modeling thinking strategies and explicit instruction on the skills good readers employ.There were many strategies and modeling examples I liked in this book. One of the methods in the book is teaching students to listen to the conversation and interacting voices inside their head rather than their reciting voice or even the distracting voice (45). I also particularly liked Tovani's "Fix It!" chapter where she outlines strategies and modeling techniques for teaching students what to do when they get stuck reading (49-61). Tovani also does a nice job writing about the modeling process necessary to help students make connections to prior knowledge and ultimately use this skill to repair confusion (63-78). In addition, she writes about encouraging student curiosity and questioning to establish purpose for reading (79-95).At the end of the book, Tovani also includes "Access Tools" or examples of hand-outs one can use to encourage the skills discussed in the book. Overall, this is a great book for teachers who would like a refresher course on reading strategies, for any content area teacher who would like to teach more reading in their class, and for teachers new to explicit reading instruction. This is not, however, a book that will rock your world as a practicing reading teacher. While a couple of the ideas Tovani includes for implementation are unique, the bulk of the book is pretty standard reading instruction. A constant go-to. It's already helped me to help several students. Usually I like when the authors of these types of books give me concrete activities and lesson ideas I can bring to my room--it's why I love Kelly Gallagher after a colleague suggested him to me--but Chris Tovani does little of that. Yet somehow, I loved her book and it convinced me that I can, in fact, teach my sophomores to be better readers. Tovani offers very general insights into reading problems and sets up very vague, but logical, recommendations to fix the places where comprehension breaks down. Her text has convinced me to completely revamp the first month of my teaching schedule next year so I can truly make my students better readers. Ultimately, what it comes down to is this: Tovani has the ethos to make me listen. She comes across as a real classroom teacher--like the colleague next door you want to question constantly because she has the best ideas. She admits her kids don't always play along, so as a reader, I feel more empowered to try her strategies. I mean hey, they didn't always work perfectly even for her so I can just try again without wondering why I failed. She helps teachers see how we can adjust when things go wrong, which is ultimately what we're trying to teach our students about reading. Great book and well worth the read. Along with Kelly Gallagher, Cris Tovani is on my list of top teacher heroes. I actually began reading her book during one summer when I wasn't hired. I really enjoyed the book but set it aside, knowing that I needed to wait until I had my own class for her book to make the most sense. This is not a book you want to forget about and leave on your shelves!The writing is incredibly readable and includes many conversations she has with her own high school students. I breezed through the book in three days and definitely got a lot out of it even though I have no intention of teaching high school (I can't get past their attitudes...). While she teaches 9-12th grade, her strategies are applicable for middle schoolers as well. She's got great ideas about teaching inference, questioning, clarifying confusion, how to tell if you're confused when reading... These are some strategies I don't even think about as a "good reader." I'm revamping my "curriculum" to use many of her strategies, and my kids will be much stronger readers (I hope) as a result. Gah, why wasn't I taught this in college?! The author gives real world, workable strategies to help struggling readers with their comprehension. She gives specific examples from her own classroom that give me hope, because I've had the same experiences myself. She says over and over again that we need to TEACH the strategies, rather than expect students to come into the classroom with this knowledge. In addition, she says admits that the strategies don't always work with every piece of text, and encourages the teacher to use multiple strategies so that students can know what works best for them.She doesn't claim that her strategies will bring students up to their grade level or that they'll magically spark a love of reading. I appreciate that, because so many "experts" DO, and then I use their strategies with disastrous results. These strategies are practical, and I'll definitely be consulting this book throughout the school year. OK, this is for work, but it's very well written and I'm enjoying the reading. Tovani, the author, was a struggling reader herself, who taught herself how to actually understand what she was reading when she was in her 30s and had "fake read" through public school, high school, and a university degree. Amazing, isn't it?Because of this, Tovani really understands what's going on in a teen's head when he can read the words, but doesn't understand what the heck is going on in the text. Because she understands what is not happening in the struggling reader's mind, she is able to isolate strategies that good readers use to make sense of the words. These strategies are then turned into practical lesson plans and suggestions. Tovani uses case studies and real conversations to excellent effect.While aimed at the high school teacher, there is plenty here for junior and intermediate teachers to take in as well. This book is fabulously useful. I don't teach adolescents (her book is directed to those who teach students in high school or below); I teach college students. But I still encounter the problems she addresses here, including students who fake-read, students who can't gain a basic understanding of texts without relying on the teacher or other students, and students who don't know how to create their own meaning from and truly interact with the text. I took detailed notes on this book and plan to use some of her ideas in my classes at the beginning of next semester, knowing full well, of course, that not all students will need these techniques but also knowing full well that many will benefit greatly from being taught more explicitly how to read. Plus, it can't hurt the ones who already know how to read to have a little refresher. I had to read this for a graduate course on content literacy. I thought the book was well written and encouraged strategies for good reading habits. One of the challenges I grapple with, however, is that Tovani implements these strategies in a classroom that doesn't appear to be subject to pacing. I think that is wonderful….but, in a history classroom that is subject to pacing, the book doesn't resolve for me how to reconcile the time it would take to use these strategies. I would love to be in the position to teach a class that encouraged literacy and I think so many students would benefit from a class like that. I hope as I become more and more comfortable with pacing in my classroom that I will be able to use some of her strategies to help my students and make what she writes about seem less "pie in the sky." Cris Tovani, a high school language arts teacher, explains what being able to read really means. She explains the reasoning for teaching reading in all subject areas and demonstrates the connection between reading and thinking. Reading goes well beyond decoding and pronouncing words. Cris explains her own struggle to truly read. She describes her ability to read and make the grades but never able to truly understand. Some of the examples she gives of her struggles and teacher responses to those struggles sound very typical. Cris explains several strategies she uses (any teacher could use) to help students read for understanding. She pushes her students to THINK.This book is an easy read and if nothing else, Cris will get you to thinking about your students reading and how that impacts all content areas. All content area teachers should read this. As a high school teacher who teaches many students who say they know how to read but don't remember what they read, I felt compelled to order this book when I heard Cris Tovani will be working with teachers from my school system on literacy. I found the strategies helpful and plan to incorporate them into my lessons because I want my students to be able to read and comprehend text on their own, given that they will face much complex reading over the course of their lives. Most of these strategies I already knew about, but what I like about this book is that it includes brief descriptions of lessons that can be used in the classroom every day. It takes the strategies from theory, telling kids to visualize or question, to actually teaching students how to do this and making the strategies part of the curriculum through modeling, scaffolding, and gradual release. Having read Mosaic of Thought: Teaching Comprehension in a Reader's Workshop and Strategies That Work: Teaching Comprehension for Understanding and Engagement, I found that this book covered very familiar ground (reworked for older students). It would be very helpful for secondary-level teachers who have never been introduced to direct teaching of reading strategies, or who need a refresher. I liked the "teaching points" with how-to ideas listed at the end of each chapter, and will keep the book on hand to refer to when planning my reading workshop. A clear, concise, no-nonsense guide to helping adolescent readers when they can't seem to make sense of their reading. Personal dialogues offer a human element to an otherwise dry text, and have helped me to conceptualize when a dialogue about reading comprehension is most appropriate; indeed, in my own (infrequent) teaching experiences, I have had discussions with students about the books they're reading that mirror Tovani's own classroom, and so helped me to launch into a Tovani-tried-and-true strategy. Pleasant, accessible, and worthy of a place in my permanent professional library. Buy this title from Powell's Books. This book is easy to read, and it utilizes some helpful strategies. There are many concepts and practices that are both beneficial and convicting. One of my problems with the books is the reading material for the students. Tovani employs these reading strategies with substantive works, and she neglects the reality of having a significant amount of material to get through. It would be difficult for many teachers to implement these strategies in a typical English or History classroom setting. These strategies would be excellent for a class on Reading, like the one she mentions teaching near the beginning of the book. However, few schools or teachers are afforded that luxury.